The 80s is without doubt the most slandered of decades. While many slam the disco and prog rock sounds of the 70s, they also accept the quality of much of Glam Rock and Punk. The 80s, though, have no such luck. Everyone remembers the Stock, Aching and Watering-can stable and poodle rock, but the quality music of the decade is all but forgotten. This CD is here to remind us. The title is somewhat misleading to those who were interested in the music in the UK in the 80s, it's only alternative to those stateside. Lots of this stuff, like New Order's 'Blue Monday', Julian Cope's 'World shut your mouth', Erasure's 'Sometimes' or the Bluebells' 'Young at heart', were big hits in the British charts, but they were "alternative" US college rock hits in the 80s, before the terms New Wave or indie were overtaken by the catch-all "alternative". There's some absolute classics on here, Lotus Eaters' 'The first picture of you', Dream Academy's 'Life in a northern town', Tubeway Army's 'Are friends electric?' (also known as the music on the Sugababes 'Freak like me'), the Cochteau Twins 'Pearly dewdrops', the late Kirsty MacColl's 'A new England', and more. There's also some great throwaway pop gems, The Primitives' 'Crash', Altered Images' 'I could be happy', Erasures' 'Sometimes' and Westworld's 'Sonic boom boy'. There are some cruddy tracks that should have remained buried, Spear of Destiny's 'Liberator' standing out in its awful pseudo-Gothness. 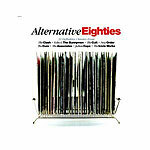 There's also some questionable inclusions, while 'Rock the Casbah' and 'Always the sun' are great tracks, should punk survivors like the Clash and the Stranglers be counted as alternative 80s music? But the surprising reminders more than make up for all this, stuff like Furniture's 'Brilliant mind', which didn't seem familiar until it hit the chorus and I suddenly found myself singing along "you must be out of your brilliant mind". This two-track CD is probably the best of the spate of compilations this summer, much better than those that concentrated exclusively on electro or synthpop. This music set the groundwork for the alternative music that became the mainstream in the 90s and is more than worth remembering. And there really is some great music on this.